Bullets don’t just fly, they ricochet! Have you ever played a game, where upon booting it up, you’re still playing it 10 hours later, even though you’re supposed to be at work or sleeping? Who am I kidding? We’re gamers, of course we’ve all had a game that’s made us do that on at least one occasion and last year, a game that had that effect on me was SteamWorld Heist when it came to the Wii U. Before Heist, I had never played a SteamWorld game and since Image & Form were kind enough to send Miketendo64 a review key to download the game, I was more than willing to give the game a go! Before I knew it though, I was hooked within a matter of minutes and I just couldn’t bring myself to stop playing. I had started at 22:02 and did not get off until 08:05 the next day. It had been quite some time before a game had that sort of an effect on me and even though I didn’t sleep a single wink during the nocturnal hours that past, I was wide awake enough that I immediately began typing my review up, because I just couldn’t get Heist out of my brain. Only, the SteamWorld addiction didn’t end there because the SteamWorld Collection had just released, with it being part of the Nintendo eShop selects range for Europe and there was no way in hell that I was going to pass up a couple. So, I brought it and I played Heist all the way through again, because I knew if I played Dig first, I’d only rush through it, just so I could get to Heist sooner. Unsurprisingly, I really enjoyed SteamWorld Dig. Rusty is a great character, the game felt smooth and it left me wanting more. Fast forward a year and a bit later, the Nintendo Switch is out and dominating, SteamWorld Dig 2 is simply phenomenal and worthy of the 1o/10 I gave it in my review and Heist is coming to the Switch and once again, I’m the one who gets to review it. But do you know what? Heist is still as addictive to me as it was last year, except now it’s the Ultimate Edition that comes packaged with all the DLC as part of a one-time payment and it can be played anywhere, at any time! But if that’s not enough to excite you enough to double, or even triple dip, then what about the fact SteamWorld Heist: Ultimate Edition even supports intuitive touch-screen controls that are so well responsive that you could easily play the whole game like it, without ever having to press a single button? Sure other versions of Heist can boast a similar thing, but it is a nice touch nonetheless! Anyhow, now that we have covered what’s new and what exactly defines Heist as being the Ultimate Edition, let’s take a moment to explain why Heist was ported to the Switch instead of Dig. Well, while Dig is the prequel to SteamWorld Dig 2, which launched on Switch this year, Heist is in fact a continuation of Dig as the Outsider from the Outsider DLC, who can now join your team very early on in the game, is none other than Fen from SteamWorld Dig 2. (Spoiler Alert!) As for the exploding/destroyed planet that is often seen and made mention to, is the earth before it blows up at the end of Dig 2. So in short, Heist was ported because of its qualities of being a true sequel, even if it is set centuries after the fact and now let’s talk about the actual game and how it plays. 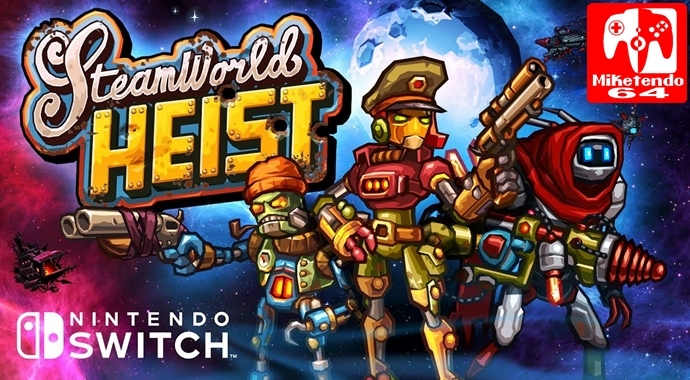 Developed by Image & Form Games (obviously,) SteamWorld Heist, before Dig 2, was the latest entry in the SteamWorld series, which as far as Nintendo platforms alone go, has appeared in the 3DS, Wii U and now the Nintendo Switch. As for what kind of a game it is, it’s a side-scrolling turn-based shooter game with procedurally generated levels and high definition graphics for the console versions of the game. With regards to the story, well it something of a galatic Western that concerns Steambots, Scrappers, a Red Queen and the Vectron! Enter Piper Faraday, a Space Pirate, who must make her escape after being captured and save what very little of a crew she has left alive. With the player on hand to guide hers and her teams movements, just as soon as Piper is able to get out of one sticky situation, a much more dire one would present itself. Within a few simple levels, the severity of the situation hits the ready to rumble Cowbot and her story quickly becomes one of the redemption variety. Being a Space Pirate is one thing, but when the universe requires a hero then a hero is exactly what it will get. Move over Justice League, Piper and Co are here and their Cyborg (Fen,) is more than happy enough to make the DC Cyborg, be about as useful as a toaster. Sure, toast is good, but not every single day. Some days, you just want French toast or fried bread. It may run you the risk of a heart attack, but sometimes fried food is exactly what the doctor ordered. Time wise, from start to finish, Heist can take anywhere between 9 and 15 hours to beat/100% complete and that’s not including the New Game+, which is more of the same, but allows things like your collectable and DLC hats, carry over into your next playthrough. (Collectable hats can be collected by shooting the hats off those you come up against in battle and collecting them.) As for what you can expect from the decently long play time, there is a fantastic soundtrack composed and performed by Steam Powered Giraffe, who just so happen to be a steampunk band that actually makes an appearance in the game, as Steambots you can encounter at Space Bars throughout the game, where they will actually play songs from the soundtrack. Like I said in my previous Heist review, I have never been one in the whole steampunk scene, the western scene, or even the folk music scene, but that little tidbit did not stop me from enjoying every single track, but none of this actually covers the action and things to expect from gameplay, so let’s correct that. With Heist being a turn-based game, this does of course mean that when playing through levels/missions, you and the opposing force take it in turns moving your bots. Only while the AI solely needs to concern itself with advancing its own units to any and all locations its bots are required to reach, to lay waste to your Steambots, you have to do something more. In addition to moving your units to defensible locations to attack from, or even sprinting out of danger, but no longer allowed to shoot in that turn, there is also saw on each level that requires collecting. This swag isn’t just something to do, but often a necessity since properly completing a level and earning all available stars, thus improving your Reputation, does require grabbing every piece of swag going. The good news though, is that the swag comes in all shapes and sizes and it can be new weapons for your bots to use, well sought after gallons of water that acts as currency for purchasing items and weaponry with, but you can even get treasures too. Should you wish to do without the treasure collecting though, you can always stick to clearing out every single bad bot on a level first, before debating whether to collect or not, but just remember on some levels, it is required you collect a set amount of swag before you can make your move to evacuate. However, you might not be able to make the trip in a single move for each bot, as bots can only move so far and if there is no bad guy to shoot at when it comes to time to end the turn for each bot, you can either fire off a frustration/warning shot, or hold Y and guard. But when new characters and abilities aren’t enough, a change up in your weaponry could be the victory. From boots that improve movement distance, body armour, side arms and just much stronger guns, to guns with scopes, every little thing counts if you wish to be the last bot standard. Then of course there’s the hats. They might not level your characters up, or boost their stats and progress in anyway, but they can look very fashionable, or absolutely hilarious, depending on what one you wish to go with. (Traffic cone wearing Fen anyone?) There’s also the fact that the hats themselves, although odd why they even have any importance or such a huge role in the game, they are awesome and just one of the many reasons as to what makes Heist be the great game it is. They add a touch of class, hilarity and epicness that emits from Heist on all levels, from the combat, straight to the writing, because that is what Heist is, epic on all levels! In truth, there really isn’t that much in the way of differences between the Heist we have on Switch and the versions we got before it, but with SteamWorld Dig 2 readily available on various platforms, provided you played it, it can cause you to see Heist, in a whole new light that we never got to experience before. There’s also the fact that Heist was already an incredible game when it released the first time around, so if you never played it before, you absolutely should, because Heist is hands down one fine as hell indie title that should not be missed out on, regardless of what platform you choose to purchase and play it on. But if you need some more convincing, here’s me bringing out the big guns, Heist has a fantastic looking icon for the Switch menu! Need I say any more now? uh, maybe mention next time you’re going to be spoiling completely different games (Dig 2’s ending) next time obviously these aren’t exactly plot-focused games but still, came here after enjoying the beginning of dig 2 to see what heist is all about and now i know (seemingly) crucial information about dig 2’s ending! oh well. Excellent review for a gem of a game. If my playthrough of Heist (and its release) were not so recent, I might spend the money to pick this one up.